SMileS SMS are the SMS providers for the Little book of poems text donation campaign. Little Book of Poems is a pocket sized book written in support of people living with life threatening illness, their families, friends and carers. All the money raised by the book goes to the fundraising (department) for Kirkwood Hospice. In order to help raise funds for the production and printing costs of this book, Little Book of Poems have set up a text donation campaign where people can text ‘POEM’ to 78484 to make a fixed donation of £1.50. In addition, to helping run their text donation campaign SMileS SMS has also become supporting sponsor of the book. Being a sponsor helps to cover the print costs of the book, without which the book could not be sold to raise money for the hospice. There are two levels of sponsorship; you can become a book sponsor for £500 or a supporting sponsor for £50. 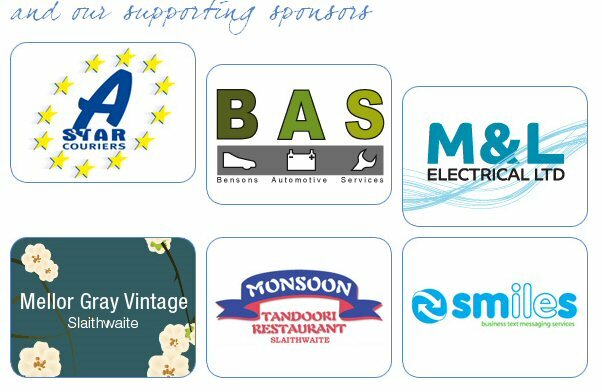 Click here if you are interested in becoming a sponsor. Would you like to use your business skills to help a charity? Are you a charity or community group needing volunteers with business skills? If so, why not come along to our Skill Will Huddersfield evening event? It’s free, there is no pressure, and it works! As a volunteer, you might have marketing, finance, HR, PR, design, IT, web or admin skills….amongst many others. There is no pressure to volunteer – how much time you offer (and to whom) is entirely up to you. Volunteering can be an excellent way of ‘giving something back’ whilst also developing your own skills. If you are a charity or community group, do you have specific problems you would like to solve, but can’t afford to pay? At Skill Will Huddersfield you will meet a broad range of volunteers, all keen to get involved and help charities likes yours. When you make your free booking, you will be asked to provide brief information regarding the skills you can offer as a volunteer, or the things you might need for your charity. Skill Will has had great success in Leeds, Hull and Scarborough already, with further events planned around Yorkshire and the UK. Over £200,000 of time has been donated already. 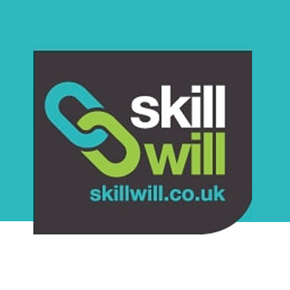 SkillWill Huddersfield will be held on Wednesday 23rd May at Catherdral House, Huddersfield from 6pm to 8pm. To register for the event visit skillwillhuddersfield.eventbrite.com or check out skillwill.co.uk for more details. SMS answers SOS call. As a charity are you taking advantage of SMS marketing to increase donations? The charitable response to the Haitian earthquake relief efforts has shown the best of individuals generosity, and their desire to meet survivors urgent needs from thousands of miles away. It has also revealed the best of the mobile ecosystem, with service providers and technology companies working behind the scenes united to expedite donations. The numbers are staggering. 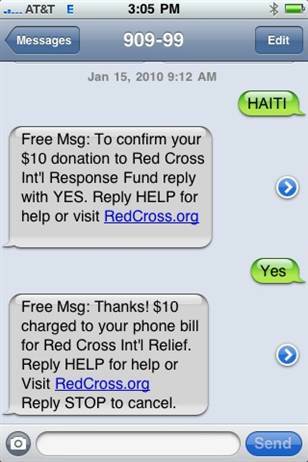 As of February 4, mobile giving infrastructure provider mGive announced that it has processed more than $37m (£25m) in SMS message donations for Haiti. In the US, peak giving hit 10,000 text messages per second through the Mobile Giving Foundation, another organization which helps charities receive donations through text messages. Geoff is a founder of the Yorkshire Mafia networking group. The YM networking group has become a very influential and important group with many of the members benefiting from the contacts they meet at the events which result in significant business deals. One main factor which has contributed to the achievement of this networking event is Geoff’s enthusiasm and passion which he puts into making each YM event a triumph. Geoff’s now taking this energy and channelling it to help the CandleLighters Charity. Candlelighters is a charity formed and run by parents of children who have or have had cancer, ex-patients and the medical staff who treat them. Candlelighters provide essential services and support to children with cancer and their families. Businessman turned adventurer Geoff Major is embarking on an extraordinary expedition – braving polar bears, thin ice and temperatures of -35°C on his way to the North Pole. 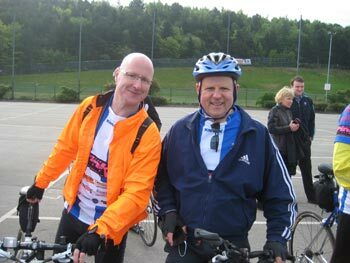 All this to raise £100,000 for charity. Here are the 4 facts you need to know about his trek to the North Pole. And you can follow Geoff’s ‘North Pole Trek’ on ‘Twitter’ @northpoletrek & on his ‘Blog’. 1. 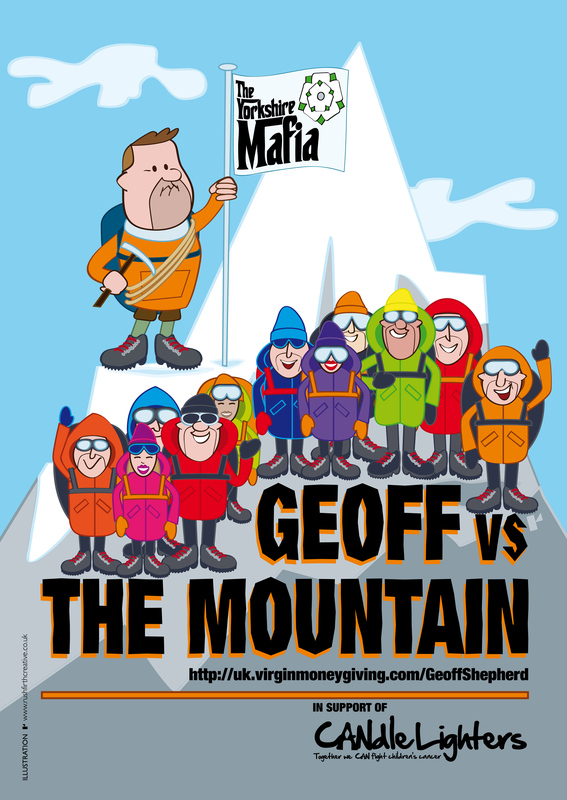 Geoff will be part of a group of up to 8 individuals all trying to raise money for charities of their choice. There will be a professional trek lead to manage us all and he’ll have a flare gun to scare polar bears away with. Seen on the photo are Jason and Paul – Richard was having his team briefing. Employees at SMileS celebrated Tinsel Tuesday for the third time by dressing in festive outfits. 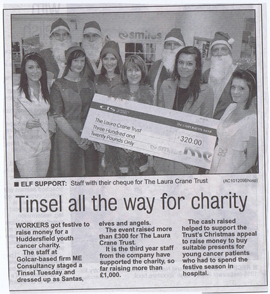 All proceeds went to The Laura Crane Trust. The Laura Crane Trust is the only UK charity dedicated to funding research specifically into cancers affecting 13-24 year-olds, where cancer can strike in dangerous and difficult forms, often necessitating very harsh regimes of treatment in an effort to save their lives. On the day we raised a total of £320, making a total donated value to the charity of over £1,000.